MIAMI-DADE COUNTY, Fla. - A South Florida man who nearly lost both of his legs in a crash on Florida's Turnpike spoke exclusively to Local 10 News on Wednesday. Carmelo Gonzalez was cut off on the Turnpike last month, causing his car to wrap around a palm tree. It took crews more than an hour to cut him out of his mangled car. "All I remember is a car coming into my lane and I tried to avoid (it)," Gonzalez said. "It's unbelievable." 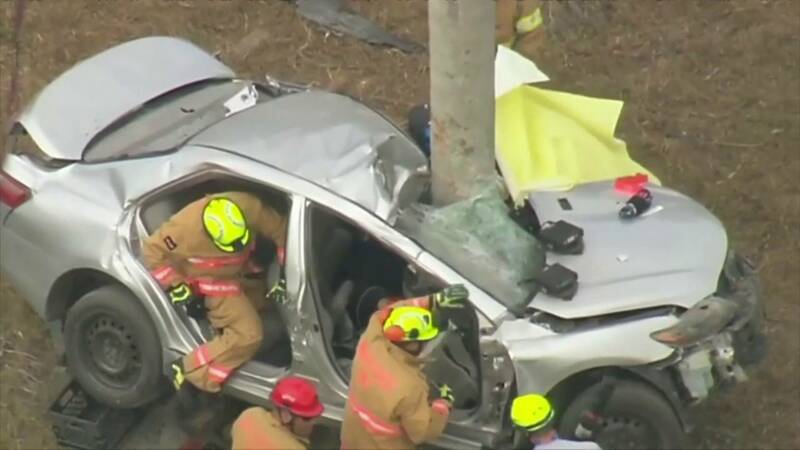 The Dec. 5 crash was a life-changing moment for Gonzalez. "I woke up, I think the next day, in ICU, and was shocked to see my legs the way they were," he said. "Going from walking every day to a chair is not easy, and we don't know that until we experience it." The 44-year-old is now learning how to walk again after his car was cut off in the northbound lanes of the Turnpike, causing it to spin out and wrap around a palm tree near the Quail Roost Drive exit. First responders spent more than an hour trying to free Gonzalez from the twisted piece of metal. "Imagine an hour trying to free someone from a car. Imagine the things they were going through. Imagine the training," Gonzalez said. The crash nearly caused the loss of both of his legs. "I broke both calves, both knees. I have knee replacements. I have plates on either side," Gonzalez said. "I met the person when I woke up -- the doctor that was going to amputate my leg, which was very interesting. And I thanked her for not (doing so)." Now, more than a month and a half later, Gonzalez is out of the hospital, but still confined to a wheelchair. He faces a long road to recovery, including months' worth of physical therapy. He now wants to thank the first responders who risked their own safety to get him out alive, as well as the doctors, who are helping him to recover. "I can't believe I'm alive," Gonzalez said. "God. God sent first responders. That's -- (I) can't say (it) enough." Because his home is not handicap accessible, Gonzalez is staying at a hotel until he is well enough to walk again. His next doctor's appointment is scheduled for next Tuesday, which is when he's hoping to put his full weight on his legs, and once again begin to walk.